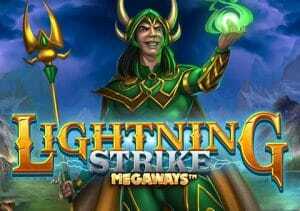 Take a trip Asgard, home of the Norse gods in Lightning Strike MegaWays. This Scandinavian saga has been created by Blueprint Gaming and is played using a 6 reel game engine. The number of symbols on each reel changes with each spin and can offer over 15,625 ways to win if they reach their maximum configuration. Also in play are expanding wilds with multipliers and re-spins. There’s also a free spins round on enhanced reels. Join Thor and friends from between 10p and £50 per spin. Like all the MegaWays video slots, there are plenty of moving parts in Lightning Strike MegaWays. We’ve found the design in MegaWays video slots to be a bit hit and miss and though not perfect, the sound and visuals here are decent enough. You’ll see lower value A to 9 symbols alongside 4 higher paying Norse deities. The most lucrative pays 0.5, 1, 5, 10 or 50 times your bet if you land 2, 3, 4, 5 or 6 on adjoining reels. As well as the potentially mind-boggling number of ways to win, there are other extras on offer that can boost your winning chances. Mystery Might feature – Yggdrasil, the tree of life symbol, has special transforming properties. All of the tree symbols that land on any given spin morph into the same symbol and a new payout calculation is made. Lightning Strike Respin feature – the Mjölnir wild (Thor’s hammer) can land anywhere apart from reels 1 and 6. Every time 1 of these wilds hit, they expand and fill the whole of the reel. They also come with multipliers attached which can boost payouts by up to 5x. There also deliver a respin when they hit with the expanded wild locking in position. Land another Thunder Strike Wild and the process is repeated. It’s possible to turn all 4 of the middle reels wild here. Mega Spins Exchange feature – this becomes active every time you land a winner of at least 5 times your stake. You’ll be taken to a new screen where you’ll be offered the chance to spin a wheel and win up to 25 Mega Spins or an increased cash award. If the pointer lands in the red portion of the wheel, you’ll lose whatever you’ve won. If your gamble is successful and you do land some free Mega Spins, then you’ll play them on an enhanced reels set. The standard extras on offer in the base game can hit during the Mega Spins too. There’s plenty of action on offer on Lightning Strike MegaWays. The design isn’t of the highest class but is solid enough. The range of extras on offer impresses though. We managed to land the best time of 1,350 times our bet after a good run in the Mega Spins. The variance is in the medium range with possible wins of 10,000 times your bet on every spin. The MegaWays game engine is becoming more and more popular. With new additions like Lightning Strike MegaWays. it’s easy to see why. I also suggest you try Vikings Unleashed MegaWays and Buffalo Rising MegaWays which is better in my opinion.